Add coloured sashes, our wedding arch or our big Love Sign letters as upgraded features to your wedding ceremony package. 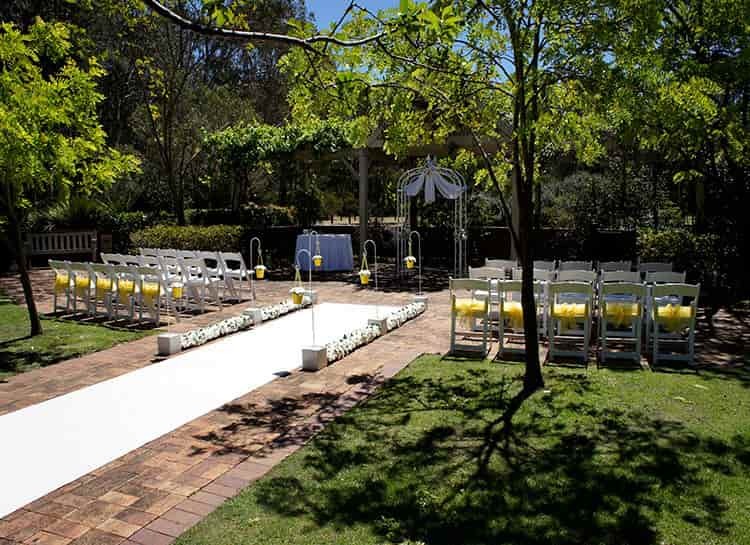 Jannawi Garden at Nurrangingy Reserve is a wonderful tree lined area perfectly suited as an outdoor wedding hire location. Surrounded by high hedged walls on two sides, the area feels intimate and enclosed. 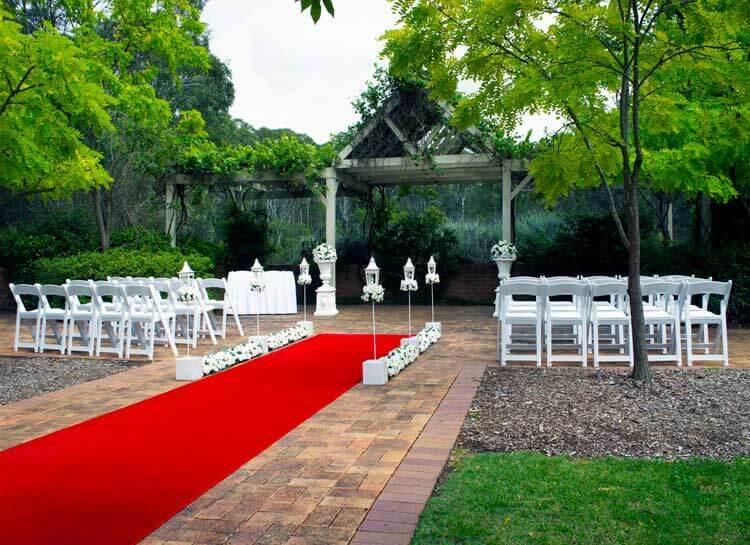 The tree lined path creates the perfect entrance and walkway for our red or white wedding ceremony aisle. 24 wedding chairs fit nicely into the ceremony hire space at the end of the wedding aisle where it widens. Upgrade the number of chairs at the time of booking if you are after more seating for your guests. Adorable Wedding Concepts wedding ceremony hire decorations are included in our packages but if you are looking for something a little different we can source the items or you can supply them directly in advance of the wedding ceremony. Customising a wedding package is what we love to do. You can choose any of the about wedding packages as a complete setting or add to them as a base to build on. Other wedding ceremony hire packages you can consider include our Princess and Eternity Package wedding ceremony decoration hire. Also available is our big Love Sign letters that you must include as the ultimate prop for family and group photos. Call 0418 624 225 or ENQUIRE NOW for an obligation free quote and consultation. 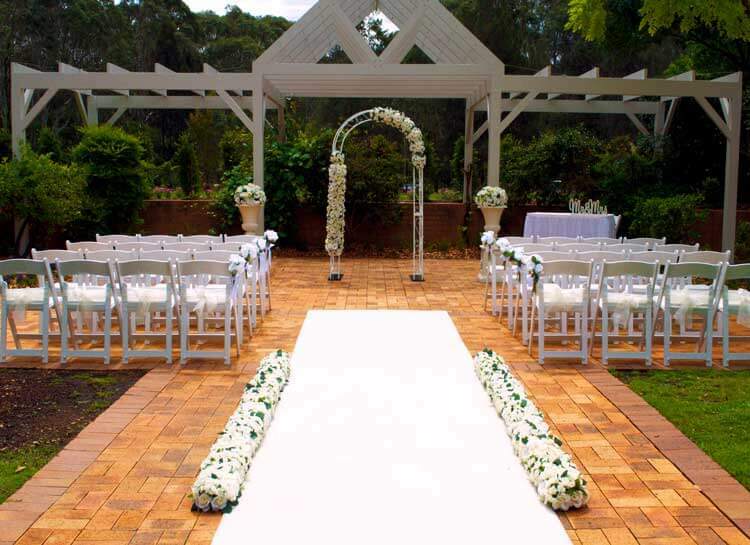 Unsure about the Jannawi Garden at Nurragingy Reserve as a venue? Contact us to discuss the style of wedding and type of venue you are looking for and we can provide you tips and insights from our 15 years of experience in the wedding ceremony industry. Adorable Wedding Concepts have an exclusive ceremony setup for brides and grooms holding their wedding recception at the Colebee Centre. Adorable Wedding Concepts recommend the Colebee Centre for your wedding reception and we are available to style the reception as well. The Colebee Centre is available for up to 200 guests, the wedding reception venue includes their famous 12 x metre ‘wall of fairy lights’, linen chair covers, coloured sashes and table centre pieces, a wedding cake, professional DJ, chauffeur driven limousine for the get away and importantly, your own dedicated function manager. 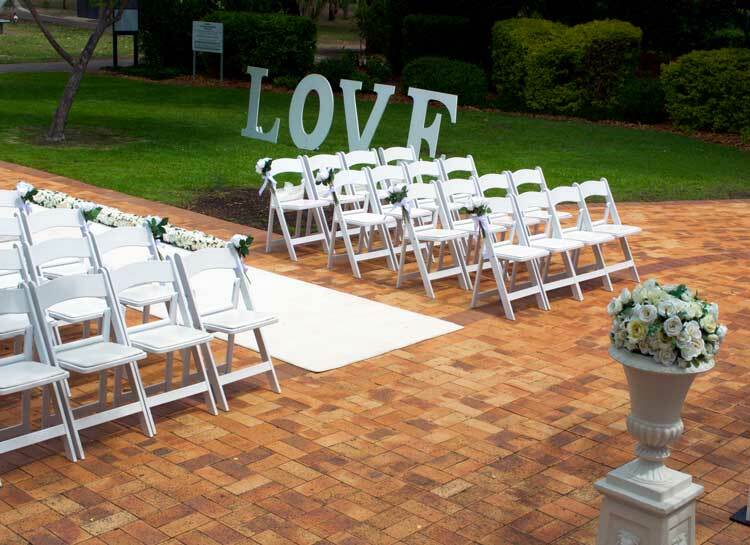 What you need to know: Jannawi Gardens at Nurragingy Reserve allow 1 hour setup prior to the start of the ceremony booking time and will no allow access prior unless special prior arrangements have been made which involve additional site booking fees.